Guwahati, Mar 11 : Two days after a huge consignment of arms and ammunition were seized by the Assam Rifles on the outskirts of Aizawl following a tip-off from the Tripura Police, sleuths have confirmed that it had originated in Myanmar and was heading for Bangladesh for use by a breakaway faction of the Shanti Bahini there. "Interrogations have revealed that the consignment had come from Myanmar through the international boundary in Champhai district in eastern Mizoram, and would have been smuggled out to Bangladesh through Tripura had we not been able to intercept it on time," Mizoram SP, CID (Crime) Joseph Lalchhuana told The Indian Express from Aizawl. While the police first recovered 23 AK rifles, one Combat Browning Automatic Rifle (CBAR), one 5.56 Automatic Light Machine Gun, 86 rounds of AK-47 ammunition, 67 rounds of CBAR ammunition, 24 rounds of 5.56 automatic weapon ammunition and 30 magazines on Friday, a second operation led to eight AK 47, three magazines and 632 rounds of CBAR on Saturday. Both the recoveries were made from a private farmhouse near Lengpui airport in Aizawl. 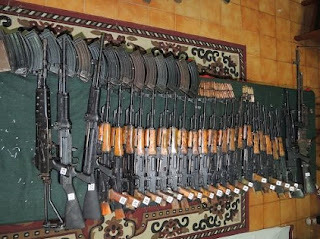 This is the first time in recent years that such a huge consignment of illegal arms and ammunition has been seized in Mizoram. 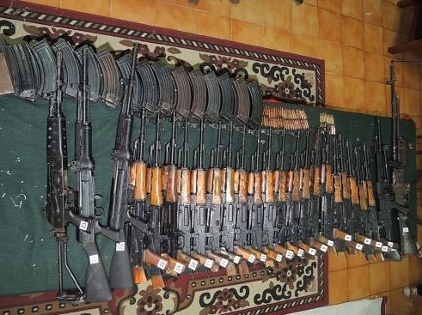 In March last year Mizoram Chief Minister Lal Thanhawla had expressed concern over the state's "porous" international borders with Myanmar and Bangladesh remaining prone to a host of illegal activities, including smuggling of weapons. "Mizoram shares 722-km long porous international borders with Bangladesh and Myanmar and free movement regime is allowed along this 404-km Indo-Myanmar border. This 404-km Indo-Myanmar unfenced border is characterised by inhospitable terrain covered with dense canopy," Lal Thanhawla had said at the Internal Security Conference of chief ministers in New Delhi last year. Lalchhuana said four persons have been arrested. Three of them are Bangladeshi nationals who had sneaked into India through south Tripura. "While the three had come to Mizoram and had already made payment for the arms, we are still working on identifying the group that had brought the consignment from Myanmar to Aizawl," the SP said. The three Bangladeshi nationals — Rabi Chakma, Sabuj Chakma and Mani Tripura — arrested in Aizawl confessed they were members of a breakaway faction of the Shanti Bahini, the armed wing of the Parbattya Chattogram Jana Sanghati Samiti (PCJSS), a Chakma tribal group based in the Chittagong Hill Tracts in Bangladesh.